The 74ACT715-R and ACT715-R are 20-pin TTL-input compatible devices capable of generating Horizontal, Vertical and Composite Sync and Blank signals for Televisions and monitors. All pulse widths are completely definable by the user. The devices are capable of generating signals for both interlaced and noninterlaced modes of operation. Equalization and serration pulses CAN be introduced into the Composite Sync signal when needed. Four additional signals CAN also be made available when Composite Sync or Blank are used. These signals CAN be used to generate horizontal or vertical gating pulses, cursor position or vertical Interrupt signal. These devices make no assumptions concerning the system architecture. Line rate and field/frame rate are all a function of the values programmed into the data Registers the status Register and the input Clock frequency. The ACT715 is mask programmed to default to a Clock Disable state. Bit 10 of the Status Register Register 0, defaults to a Logic "0". This facilitates (re)programming before operation. The ACT715-R is the same as the ACT715 in all respects except that the ACT715-R is mask programmed to default to a Clock Enabled state. Bit 10 of the Status Register defaults to a Logic "1". Although completely (re)programmable, the ACT715-R version is better suited for applications using the default 14.31818 MHz RS-170 Register values. This feature allows power-up directly into operation, following a single CLEAR pulse. This is one package pinout of 74ACT715-R,If you need more pinouts please download 74ACT715-R's pdf datasheet. 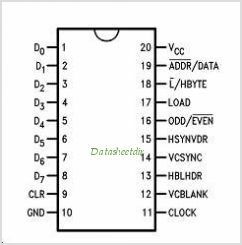 74ACT715-R circuits will be updated soon..., now you can download the pdf datasheet to check the circuits!